Following the successful first and second edition in 2016 and 2017 respectively, Gulf Learning has launched the third annual edition along with the awards. The event is the biggest HVAC conference and awards in the region and will be held on 18-19 September, 2018 in Dubai, United Arab Emirates. The event is officially supported by the Ministry of Energy & Industry, United Arab Emirates, Air-conditioning, Heating, and Refrigeration Institute (AHRI), American Society of Heating, Refrigerating and Air-conditioning Engineers (ASHRAE) Falcon Chapter and other important government and non-government organizations. 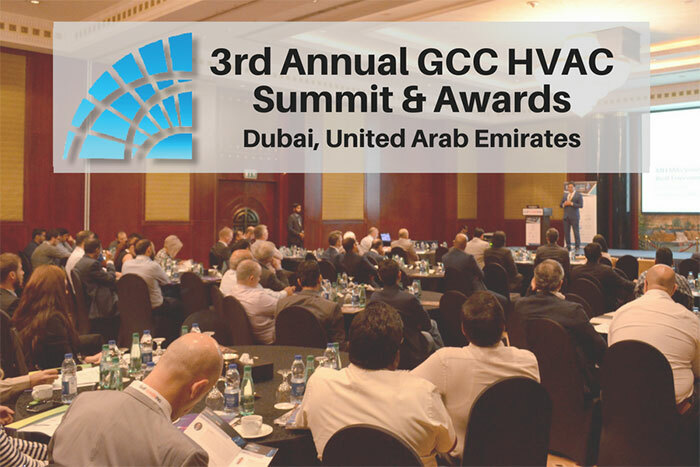 With a steadily growing demand for the Heating, Ventilation and Air Conditioning (HVAC) systems in the Middle East, the 3rd Annual GCC HVAC Summit & Awards will be aiming to have deliberations focusing on the Variable refrigerant flow (VRF) system, Chillers, Indoor Air Quality (IAQ), Filtration, Ventilation systems and the upcoming technology trends in the HVAC industry. The summit will be attended by the experts and decision makers of the leading organizations including the Developers, Contractors, HVAC Manufacturers, Design and Engineering Consultants and Regulation bodies.